Benno survived the operation but was feeling much worse than yesterday. Hid doctor assured him he’ll start walking tomorrow. The current estimate is that he’ll be released in three or four days. Amazing. I still have visions of people with a broken leg having to stay in the hospital for weeks. Time’s have changed. After visiting the hospital, we checked out that huge Mughal construction, the Red Fort. Slowly Slowly. Meaning that by the time we were finished, it was already getting dark. A couple of drinks at the roof terrace of uur hotel and we went to see a Bollywood movie. 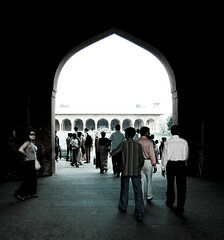 The Red Fort is big, but it’s not too impressive, rather empty.